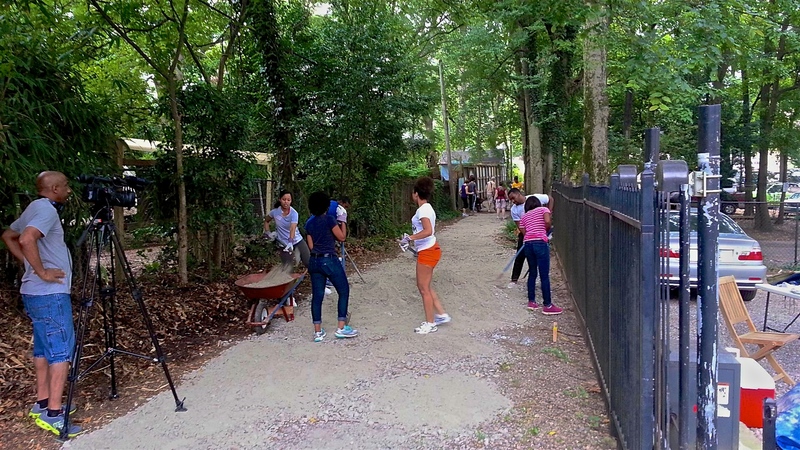 The alleyway that runs parallel to St. Charles and Ponce de Leon avenues, between Frederica and Barnett streets, received a big dose of TLC from local residents and student volunteers this past weekend. 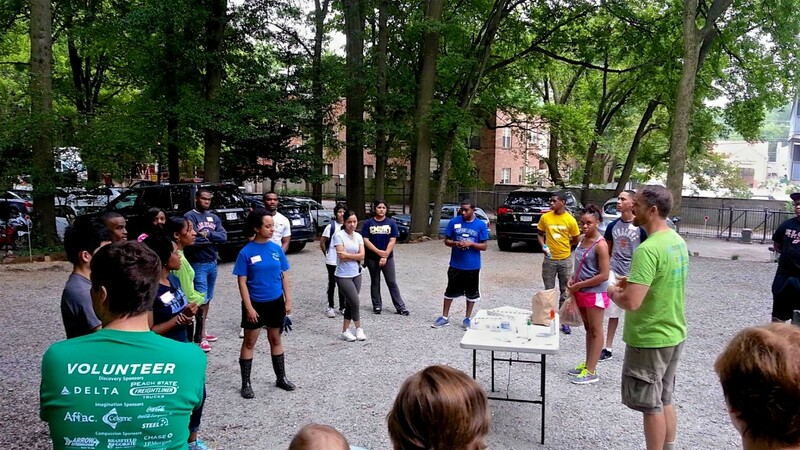 A group of 30+ worked from 9AM to noon on Saturday July 12 to clear brush, collect trash and recyclables, and spread gravel to improve the alley known locally as “Maiden Trail”. 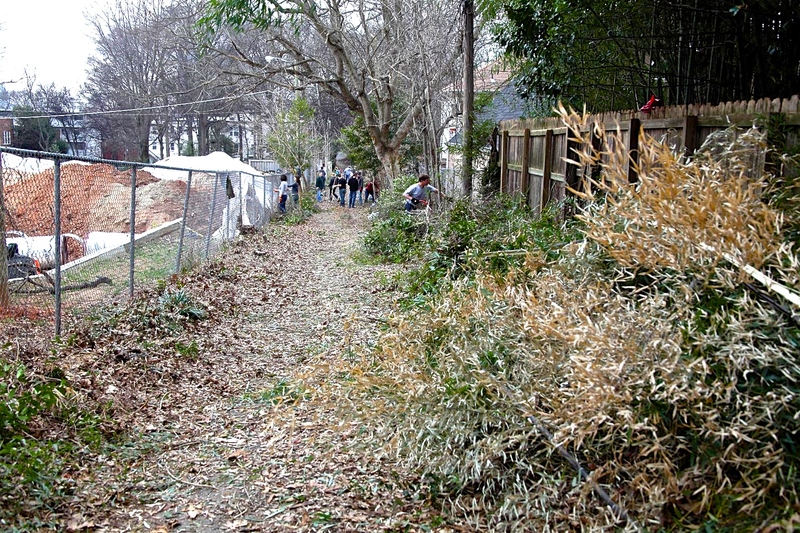 Neighborhood residents most closely engaged with maintaining and improving the alley formed the Maiden Trail Conservation Group in late April. The group’s goal was to apply for and win a ‘Love Your Block’ grant from the City of Atlanta, and the group was advised in late May that they’d been awarded $1,000. 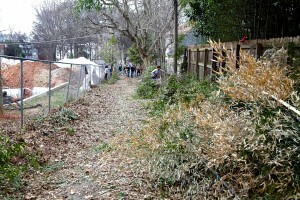 Some of the funds were used to improve the alley’s surface and overall appearance during this most recent workday. A dozen bags of trash and recyclables were collected and 13 cubic yards of gravel was spread in just a few hours with the help of more than 20 college student volunteers. These students are recipients of Gates Millennium Scholarships, which provide each student a full 4-year scholarship to use at the college or university of their choice. 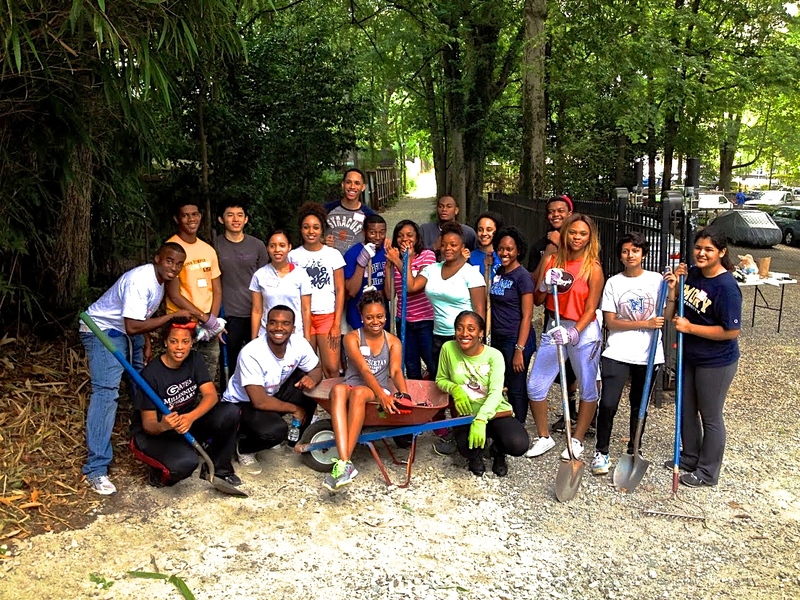 The students give back to the community through various volunteer activities. Councilman Alex Wan of District 6 provided bottled water for the group and the Atlanta Community ToolBank lent shovels, rakes, and wheelbarrows at no cost for the event. Future plans for Maiden Trail include planting shade trees and perhaps adding address markers to help APD officers more easily identify locations along the alley when responding to assistance calls. Please join us and bring your neighbors! Wear work clothes, comfortable shoes and work gloves; tools will be provided by the Atlanta ToolBank. Volunteers should meet at the alley entrance on Barnett Street where it intersects Maiden Lane. We look forward to working side-by-side with you at these two upcoming workdays! Like our Facebook page to keep up with group activities: https://www.facebook.com/MaidenTrailATL. Residents who have been working to improve the condition of the alleyway that runs east of Barnett between Ponce and St. Charles – which they’ve dubbed Maiden Trail – have organized another clean-up event for Saturday May 3. Anyone who wants to help remove trash and overgrown brush from the alley is invited to meet at the Barnett St. entrance to Maiden Trail at 8 AM, or just show up and join the group whenever you can. Volunteers should wear work clothes and bring gloves. Trash bags, other supplies and bottled water will be provided. The group’s commitment to caring for the alleyway was rewarded this week when they were told they are the recipient of a City of Atlanta ‘Love Your Block’ grant to fund continued improvements. 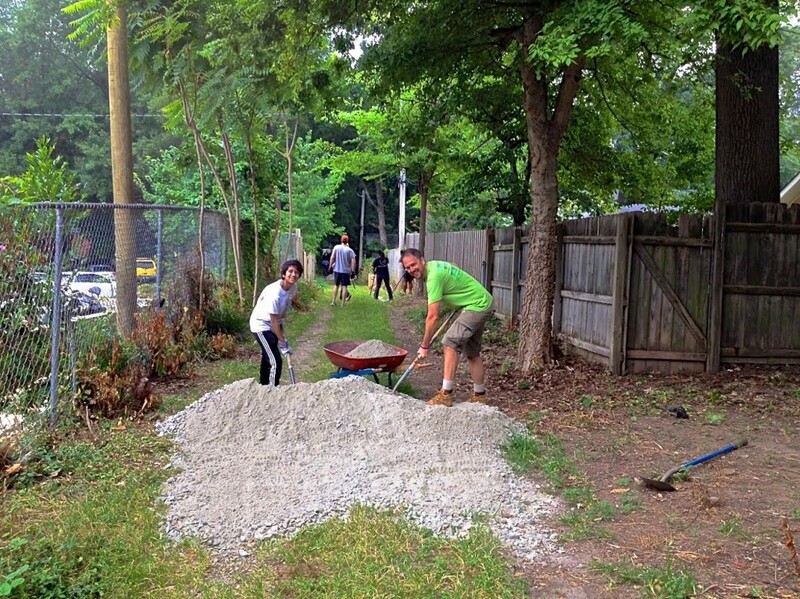 The award – which could be as much as $1,000 – will be used to purchase gravel to fill in ruts and plant native trees along the improved alleyway, according to organizers. To aid police in responding to 911 calls, the group is also working on a plan to post St. Charles Ave. street numbers on the back fences along the alleyway. “The Maiden Trail project for improving this particular alley continues to evolve thanks to the hard work of dedicated residents,” says organizer Christopher Juckins.